Hello world. Here at Leicester MST we wanted everyone to know about our first year in service as an MST team, whilst having constant attention from the world media (well not us exactly). 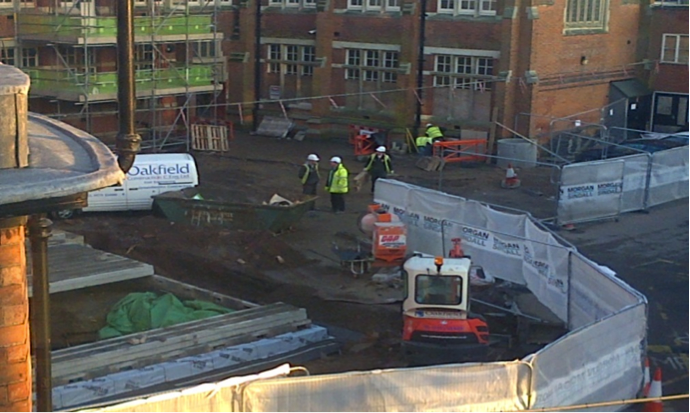 Directly outside of our office window, the remains of King Richard III were found under our carpark. This was one month before we began. During our first year, not only have we had to learn the MST ropes, we have also had to navigate a steady stream of tourists and press attention. There have been subsequent archaeological digs and work continues (see photo below – the grave is under the green tarpaulin). We are next door to the planned new King Richard III visitor centre, which you may visit (pop and say hello if you do! ); in addition we have lost our carpark! None of the royal interruptions have prevented us from having a successful start. We have recruited and retained a brilliant team, and are having some really successful outcomes with our families, including only one child placed in care and none lost to custody. We are oversubscribed on referrals and have a wide range of agencies making use of us. We have even managed to get a video on the web, promoting our ambition of going global! You can access our MST video here. If you want to see more about the dig, click here.